All makes mostly Classic cars, a few commercials and heritage buses and coaches. Oldest: 100 year old Ford Model T.
Classic Cars and heritage buses and coaches : Cars from 1915 to 2005 heritage buses from 1949 to 1998. 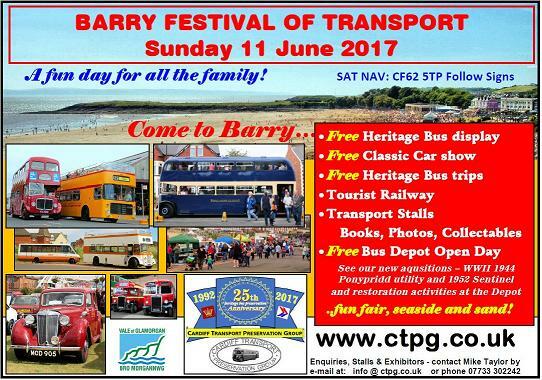 Free Heritage Bus Trips, The show will take place at the Nell�s Point car park and on the promenade adjacent to the beach and all the amenities. As usual we will have regular buses running to the Bus Depot where stalls and refreshments will be available, the event site will contain the large static displays of cars, commercials and public service vehicles. Classic cars will be parked on the promenade as space allows and then on hard standing inside the adjacent car park where the larger vehicles will be displayed.